Common butterwort. Note insects on leaves. Photos by Laura Kroesen (closeup), Sara Wickham (top left and bottom right), Brian Starzomski (top right), and Gillian Harvey (closed flower). 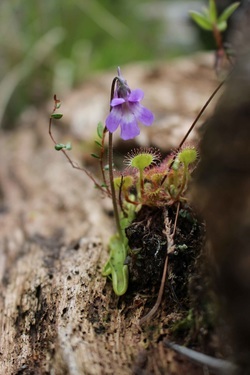 The common butterwort is a fairly recognizable carnivorous plant. It has a rosette of leaves clustered at the base, out of which one to four stems grow, reaching up to 16 cm tall. Each stem is adorned with a single, bright purple flower. The leaves are distinct — fleshy, and slimy on top with rolling edges — making identification relatively easy even when the plant is not in flower. The common butterwort is found in moist sites from low to subalpine elevation in coastal BC, like fens, bogs, water seeps and swamps. It is ubiquitous in coastal BC, and is found across Canada at higher latitudes, stretching south into the northwestern coastal US. It is found throughout much of northern Europe and some parts of Asia as well. 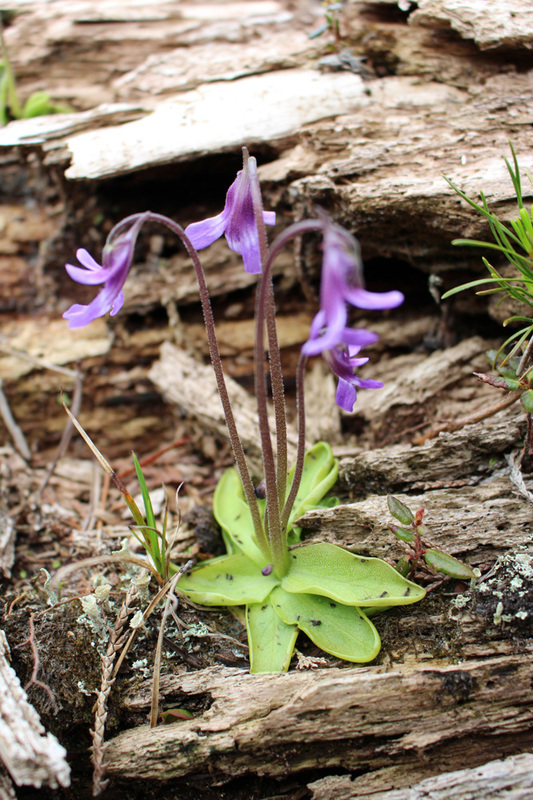 Common butterwort leaves were traditionally used in Europe to curdle milk for making cheese, and the Sami people of Norther Europe traditionally use juices from the leaves to make a type of junket (a dessert) . In UK folklore, the plant was thought to have magical properties; liquid from the leaves was rubbed on cow's udders to protect the milk from evil influences. 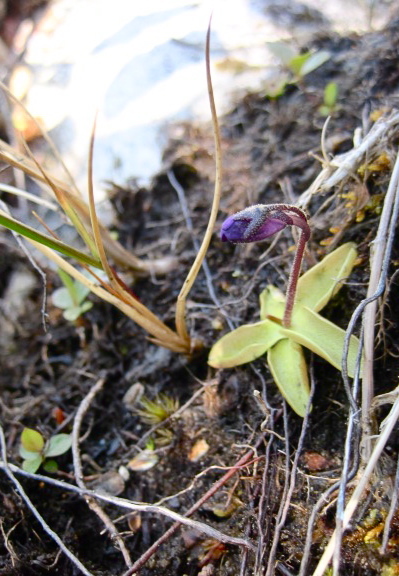 In BC, hairy butterwort (Pinguicula villosa) can sometimes be confused with common butterwort. Hairy butterwort has hairier stems and smaller flowers. 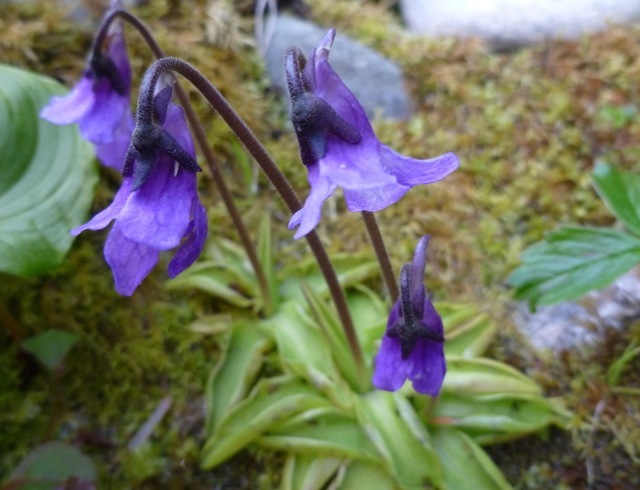 It is less common and is generally found in wetlands north of Haida Gwaii to Alaska. 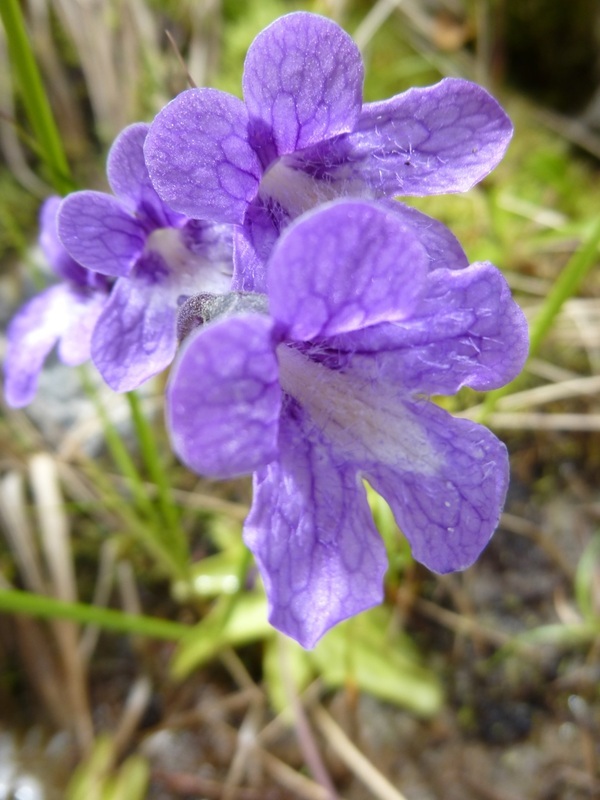 The leaves of the common butterwort produce a sticky fluid which attracts and traps insects. The leaf edges roll inwards to prevent escape while another enzyme-containing fluid digests the insects. These insects provide an important source of nutrients which are otherwise scarce in the nutrient-poor soils in which common butterwort grows. Other insectivorous plants in coastal BC include the round-leaved sundew and the great sundew. Common butterwort (Pinguicula vulgaris). ARKive. Accessed 01/26/13. Pinguicula vulgaris: Common Butterwort. Central Yukon Species Inventory Project. Accessed 01/26/13. Chanda Brietzke and Brian Starzomski (2013). Edited by Ian Cruickshank.